Most cats are pretty territorial. But some cats actually do like going out and exploring new places. This one wandered around the park a bit (on quite a long leash) and sniffed at more or less everything before coming back and falling asleep against dad’s leg. I wonder if you can train a cat to be like that if you take him out and play with him in lots of places as a kitten. Pretty kitty. Very distinctive markings. I wonder if it’s some special breed? 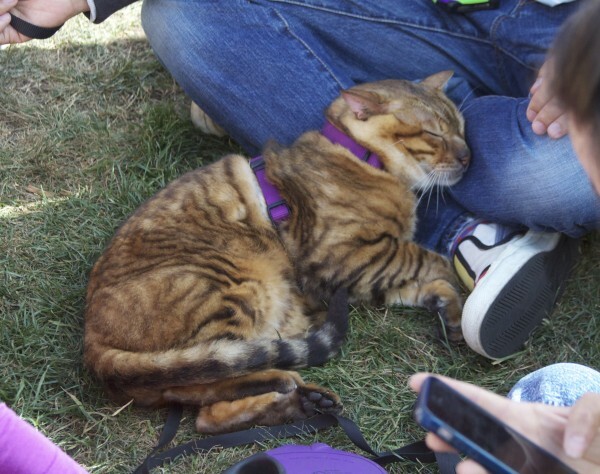 This entry was posted in Dog of the Day and tagged Cat, Mission, Mission Dolores Park, Tiger Tabby. Bookmark the permalink. Beautiful cat! As you say, amazing markings. Did you discover what breed the cat is? Hmmm – did a bit of ‘googling’ and came across this https://en.wikipedia.org/wiki/Toyger – possible? Wow, ask and I shall receive. Two different people, both apparently with the right answer, within a day.